First week of the new year, and first day of -30 so far this winter. Really, nothing to gripe about, but if it’s weather and Alaskans are talking about it – well, more times than not, there will be complaints, comments, and reminiscences about the Big Ice Storm of ’10 (or whatever the latest weather event d’jour is) rather than just a mere acknowledgement that yes, like everywhere else on the globe, we have weather. 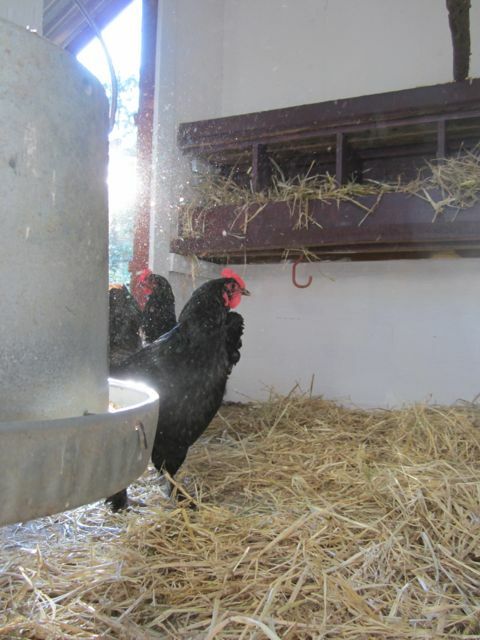 With the arrival of the first true cold day of this winter this morning, the chickens went onto a 24-7 heat lamp. This winter I have been trying something new. 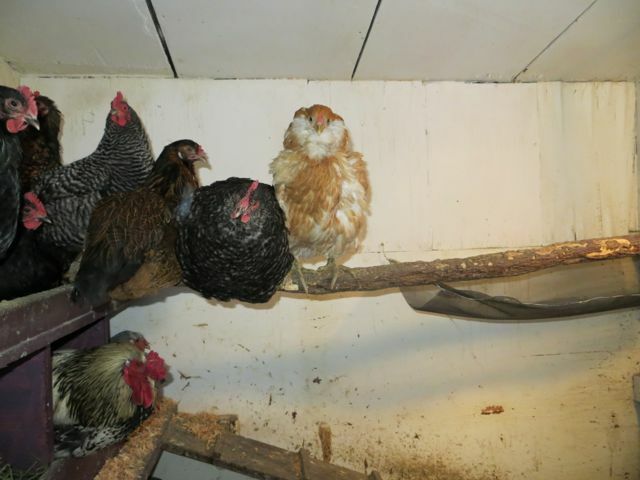 Early in the fall, I decided to be a bit less stingy with the electricity and give the girls (and Gandolf the Rooster) more heat regardless of outside temperature. 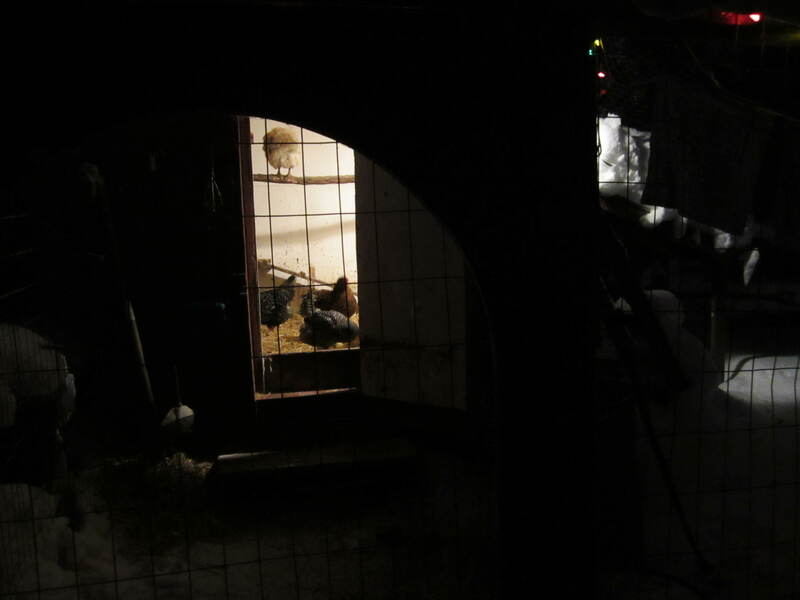 For all of my other chicken-keeping years – the heat lamp didn’t go on until zero to -10 degrees F. This meant that most times, the coop was pretty chilly: about 35 to 40 at perch-level, definitely in the 20s at the far reaches. Previously, if a heat lamp was on when it was 20 degrees above zero – well in my view that was like leaving the front door open with the heater going full blast: a needless waste of energy. I also had a (half-baked) notion that if I kept the coop relatively cool/cold in its far reaches, it would slow down decomposition of droppings and generally help in keeping eye-watering ammonia fumes at bay. I had also heard (through the coop rumor-mill) that turning on/off heat lamps repeatedly when the bulb was cold would lead to faster bulb demise. Wrong on all accounts. By putting the heat lamp on a timer, and having it come on four times throughout a 24-hour period even when we hit close to 32 degrees, the coop stayed much, much drier. There was less frost build-up and the troublesome problem of condensation seeping down the walls (which always plagued the coop in outdoor temperatures above 32) never materialized during our Christmas chinook. This in turn led to not only happier chickens (and warmer chickens) but because there was less moisture, the bedding stayed fresher longer and the droppings did not decompose as rapidly. Clean-up of the coop is also much easier – because nothing is frozen to the walls or the boards in the far reaches. I also was surprised at how small an impact there was on my monthly electric bill. For sure, there was an increase, but I estimate it to be about 10$. And of this writing, the bulb is still going strong even though it’s well over a year old. On a closing note – apologies to all for being AWOL for a considerable period of time. Other work got in the way of the enjoyable task of writing about chickens. The home flock is still going strong – with at least three hens pushing 10. Yes. I know. Most do not keep their layers around into their dotage. Perhaps it is just because it’s sort of interesting to see how long these girls will live when they are safe from predators and get three squares a day. Today, the P-hammock (as I have come to refer to it) came down. It’s a great idea that my chickens roundly gave the middle toe to. Every morning for the past week when I opened the coop door, I hoped to see the usual 4 or 5 birds that have occupied that portion of the roost without fail for the past five years neatly lined up with their rear ends properly aligned. Instead, what I had every morning were a dozen birds (even those on the roost not covered by the P-hammock) lined up with their heads cocked over their backs – tails pointing away from the wall and into the coop – giving me the stink eye. It might be tempting from this to assume that this is just the way my chickens have always roosted and I placed the sling on the wrong side of the perch. Nope. All generations of the birds I have kept in this coop for 10 years have always roosted facing into the coop. Never ever did they roost facing the wall. To really appreciate the ability of the chicken to transmit its approval (or disapproval in this case) of a change in its environment, the new alignment of all of my chickens means that every single one of them flew up or jumped up from the ramp below, which is against the wall, and then turned around on the perch to settle into looking at the wall…. an acrobatic maneuver that has certainly never been the norm in this coop. Oh, occasionally in the last week I have caught my one hen, Goldie, sitting over the hammock and depositing a token dropping, but in general, the chickens have spoken. More frequent mucking out of the litter will continue to be the order of the coop – no new-fangled ideas like P-hammocks. On a less silly note – really the problem is that the way I have my coop set up, it’s not conducive to effective use of a hanging net or screen under a roost. A careful examination of the pics that Linda D provided on the Chicken Wire shows that those perches are lower, and have the screen set up so that it doesn’t matter which way the birds orient (or so it seems from the pics). My coop has restricted access for the birds to reach the perch, which is quite high off the ground (to maximize them being at the warmest parts of the coop in winter) and it is a long piece of willow that spans the whole coop horizontally. I think because of the height and the way the birds access this, their main roost, the screen was just too visible to them, and they could not (would not) overcome their suspicions of such an odd thing hanging in their coop. It’s always worth a try, though, to take an idea that works in one coop and see if it works in yours. Or not. What we have here is a failure to innovate! The thaw has arrived. Or perhaps it is a faux thaw, as often happens. But real or just a tease, the past week’s temperatures have been warm, the snow is melting and the sun is back. As every Alaskan knows, or at least those that don’t live on entirely south-facing slopes, it’s that dreaded time of year when one’s house is flooded with sunlight. Dreaded because now there is no ignoring the wood ash, dust, dog (or cat) hair, and other flotsam and jetsam that accumulated during those dark winter days. Then the house looked “quaint & cosy”, now it looks like something that could be featured on A&E’s Hoarders. Strong daylight has a way of doing that. So, the past couple of weeks have been a flurry of spring cleaning, and before the energy dissipated, or I got fed up with the whole regime of dust cloths, mops, brooms and the like, I decided to tackle the hen house – not only to give it its customary spring muck-out, but to start on the long list of improvements I plan to do this summer (of which you will undoubtedly hear more about as the spring progresses). Chief among these was to try the “poop hammock” that was recently posted on the Chicken Wire by Linda D. This is a piece of screen, made taut with some wire, slung under the main roost to catch droppings. She uses hooks on one side so the screen sling can easily be detached and emptied of its contents into a bucket. This seemed like an easy (brilliant actually) way to reduce the stench and amount of mucking out required by confined birds throughout a long winter. So this morning, preparatory to cleaning out the coop, I spent a good two hours rigging up an experimental poop hammock. Because of the way my coop is configured, and because the birds generally reach the roost by launching off their nest box ramp, I decided to try a hammock under just one half of the roost – figuring that catching and removing half the droppings was better than none. So it was with great excitement that I made my evening trip to the hen house – eager to see just how well this contraption was working, imagining several of my hens tidily lined up in their customary spots on the roost, neatly depositing their droppings into the hammock. Except, not. What I failed to factor into all of this is the chicken’s great ability to immediately recognize something that is not kosher in its environs* and to not only treat it with the greatest suspicion, but to avoid it all together – even in a 6 x 6 coop. in Scientific American. Feb 2014, Vol. 310 Issue 2, p60-65. I’ve added a new tab: the Chicken Wire. It contains a link which takes you to a private Wiki that I have set up for questions, discussions and information. Anyone who joins can edit, post, and upload files and photos. I started this because there is a lot of good information and a lot of experienced backyard flock owners in Alaska and elsewhere, and, as I have found, I don’t have the time to post as much as I would like to. I get a lot of questions from people about chickens, and often, the answers I give them come from other people that have more experience or are cleverer in solving problems with backyard flocks than me. So, to share the wealth, the Chicken Wire was hatched. Because it is private, it does require signing up and creating a username and password (and then of course, remembering same). However, the benefits to having a private wiki are obvious; it will save us all from having to wade through countless postings about viagra, and that certain individual in a far away country that needs just a couple hundred dollars to make it back home. Hope you will join the collaborative chicken chat – and despite the cute alliteration, it’s a forum that is open to all things poultry. Thanks to the Lower 48 taking on our Polar Vortex- winter here in Fairbanks has been perfect: mostly warm, with plenty of snow for skiing and other winter recreating. It’s been good for chickens too. Maybe not for outside frolicking as mine don’t really care for the snow, and they haven’t reached that level of coop-fever that drives them out into the snowy yard. That will happen in early March, but it has more to do with sun angle and warmth than with them being thoroughly fed up with being inside. But even if your chickens won’t venture outside right now, mild temperatures are great for regular henhouse airings. If yours is anything like mine, by January there is a definite funk built up inside as a result of a number of birds living, eating and yes, doing what chickens do, pooping in a small space. When it’s 30 below, that funk sort of crystallizes into an inert, non-smelly frost in the far corners and near the floor of the henhouse. But with temperatures regularly above zero, and in many cases flirting with the high 20s and 30s…I have moisture running down the walls, and my deep litter method has to be changed a lot more frequently as the straw and manure mixture starts cooking. While warm winter weather can produce these not-so-good interior conditions, even with a vent (I will sometimes spend a little electricity when I don’t need to and turn on the heat lamp for a few hours to help dry out the henhouse), it also allows you to air out your henhouse and give your chickens some welcome fresh air. If you are conscientious about keeping your small coop door free of litter and ice (I am not) you may be able to regularly open the hen door for additional air circulation. I used to do this, but quickly tired of the regular chore of chipping and banging the door open. A fellow flock owner, who is much more experienced in keeping all sorts of poultry (chickens, ducks, geese and turkeys) here in Fairbanks than I am passed on to me her tip: she opens her main door and hangs an old quilt over the door on warm days. Of course, “warm” is a personal definition for both flock owner and the involved poultry, but generally, if it is 20 degrees or warmer, this would be a good thing to do for your coop and its inhabitants. Another option, the lazy-person’s (which is the one I use), is simply to partially open the door for a couple of hours. While opening the small coop door does give additional fresh air, it doesn’t allow for as much air circulation and much-needed air exchange as having the larger door open for a period of time. If you are a first-time flock owner in a northern climate, do begin opening your little coop door on warm sunny winter days in late winter – at some point your chickens will decide the sun is at the right angle and they will begin spending some portion of their days outside. Be sure to sweep/shovel an area clear of snow as they are not too keen on being in it. Despite the coop being a chilly 40 degrees at this time of year, Cinnamon doesn’t seem to be bothered by it; she’s had no problems with frost bite, eats heartily and is now growing out a new wardrobe. It is my (admittedly) unscientific observation that Americanas and Easter-eggers seem to go through a more thorough all-over body molt than do some other breeds. I don’t often have Americanas in my flock – most of my birds are Rocks, Wynadottes, Orpingtons, Cochins and Langshans. They seem to take their molting less seriously, molting more in rotating patches than undergoing a near total de-feathering. I often get questions from poultry newbies experiencing the first molts of their new flock. A full-on molt (such as the one pictured at the right) often alarms a new flock owner – who may assume that that their chickens have some sort of parasite or disease that is causing such severe feather loss. 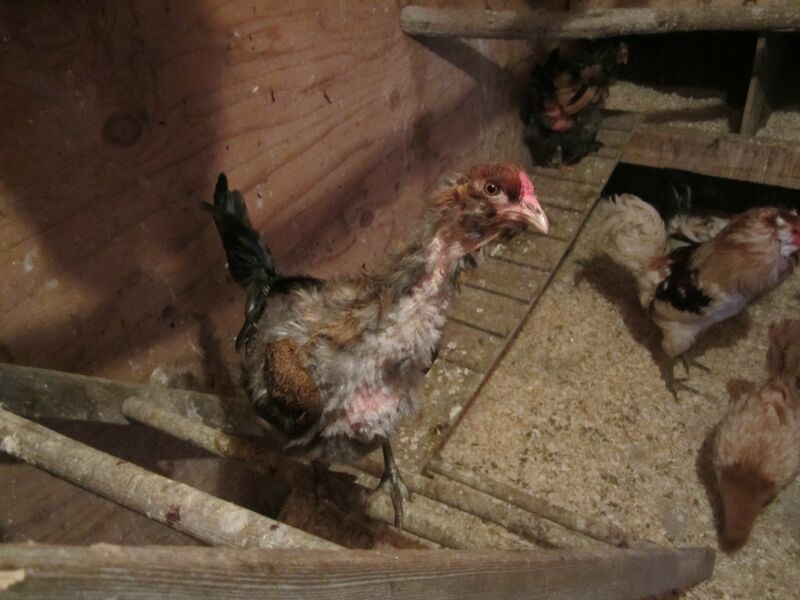 While parasites can be a cause of patchy feather loss, there are two things to keep in mind when confronted with birds that seemingly overnight, have transformed from fluffy handsome henny-penny chickens to bald, goose-pimpled, scrawny things. First, do inspect your birds. If parasites like lice or mites are to blame, you will be able to see them scurrying around on the skin, and/or your chickens will be picking and scratching. Second, if you haven’t been touring coops or been around other flocks, and your birds haven’t been troubled with external parasites, it is not very likely that your previously healthy and pest-free flock will suddenly become infested, especially in an Alaskan winter. 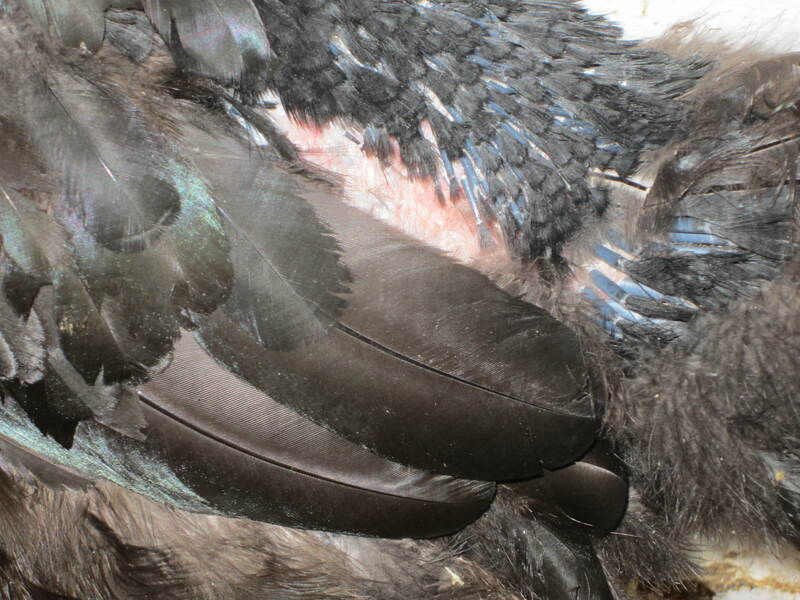 Keep an eye out for new feather emergence to seal the deal that it is a molt they are experiencing. New feather growth first looks like the chicken’s skin has been peppered with buckshot, but very quickly you will be able to see the feather shafts, at which point your chicken will look a bit porcupine-esque. Usually you will see feathers in all stages of development, as modeled by Wah the Langshan. ….99.9999999999% of chickens in Alaska hate winter. Gandalf the Rooster registered his disgust today at approximately 1:30 PM when he burst out of the sealed lower coop door and gave a thoroughly peeved-off crow. I was alerted to the chicken escape (into potentially frostbite-inducing temperatures) by the fact that his crow no longer sounded as muffled as it normally does in winter when he is sounding off from inside the hen house. Sure enough, when I went outside to investigate I found Gandalf and his number one lady hen tentatively making their way down the ramp. A chicken with the initiative to open the little coop door is a first for me. It’s not exactly rocket science, and any sled dog worth its biscuit in a similar situation would have figured out how to tap the door open, as it is not secured with latches or hasps. But in 10 years of chicken habitation of this particular house, not one chicken has ever tried its luck at effecting its escape – not even the late Stew Paul, a rooster who refused confinement to the detriment of his comb and wattles. Number One Lady Hen quickly tired of the chill and retreated back inside, but Gandalf hung around outside a bit longer…letting off steam and giving anyone who would listen an earful over the indignities of being sequestered in a small, rather smelly box-like building for weeks and months on end. Survey results also show that Alaskan chickens, like most Alaskans, would rather spend the winter in Hawaii.